DArkness Makes SEnse in the Light (DAMSEL) is our carnival arts therapy programme and is part of our AVS Project; and uses Carnival Arts as Therapy to help heal and soothe the emotional and mental health effects of abuse or reduce the symptoms in mental health conditions by using various therapies. Use the Arts as part of their therapy and healing process. Raise awareness of their cause at carnivals, festivals and art events. Working in tandem with our A.V.S. project (Abuse Victim Support) DAMSEL encourages abuse victims to participate in various art forms as a means of recovery and coming to terms with the devastating and long-term effects that abuse has on its victims. This video depicts the rise of NRP from Victim to Queen’s Award Winner. Our CEO used Carnival arts as therapy, having found this to work so well in aiding her recovery, she decided to start a project to help others that have been affected in this way use carnival arts as therapy. 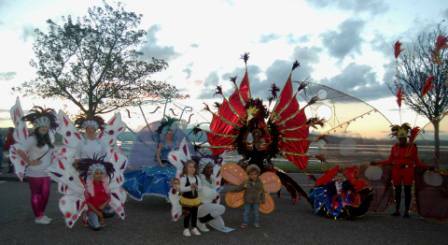 Carnival Arts As Therapy – How it works. Especially relevant, is active involvement in the performing arts part of the project contributes to the physical, mental and emotional health of all participants. Physically they are provided with fitness/dance training under supervision for a period of 16 weeks. Simultaneously, members are involved in the design and production of vibrant and stunning carnival & festival costumes and work as a team sharing specialist expertise at all levels, to reflect their own personal feeling of stepping into the light. Finally they undertake First Aid and SIA (security) training as part of the preparatory process for events. For participants who prefer to not to be so energetic; we use creative and vocal arts, such as digital and visual art, spoken and written word; as a means for individuals to come to terms with and express themselves during the healing process. Again this contributes greatly to the overall mental, emotional and spiritual well being of participants. Many of these individuals also contribute to the back stage or creative part of the carnival costume making and float decoration mentioned above. The second strand of this project is using community events as a vehicle to disseminate information packs. Having strong and confident individuals who have survived abuse available to participate in the festivities;- as part of the carnival parade, festival performance or Art work display at these events; helps to raise awareness and increase public understanding of the long term effects of such abuse. At each of these events counsellors specifically trained in dealing with abuse victims are on site; to inform individuals of help provided and help individuals to identify causes and effects of abuse in the wider society.